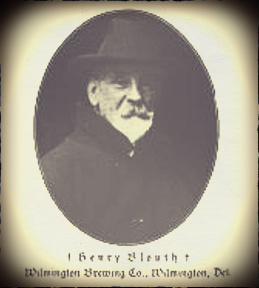 Henry Blouth immigrated to America from Bavaria as a young man, settling initially in Troy, New York, where he operated a saloon. While traveling to Wilmington with a brass band, Blouth met and fell in love with Carrie Stoeckle, the daughter of brewer, Joseph Stoeckle. The two were married and lived in Troy. In 1882, the Blouths moved to Wilmington. Henry, likely with his father-in-law’s assistance, purchased property at Front and French streets, and built the Grand Union Hotel and saloon. The hotel was one of Wilmington’s finest and was strategically located across the street from the train depot. In 1901, Blouth began construction of his own brewery and bottling plant next to the Grand Union on French Street. Blouth’s brother-in-law, Harry Stoeckle, president of the Joseph Stoeckle Brewing Company, was not at all pleased with the competition. 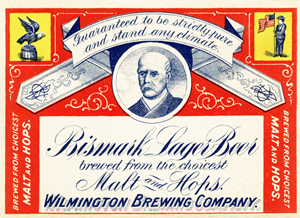 When Blouth opened his Wilmington Brewing Company in December 1902, it had an annual capacity of about 20,000 barrels. Eventually, Blouth opened an on-site bottling plant. The company experienced steady growth until Blouth’s pre-mature death in 1913. His wife promptly closed the brewery and sold the machinery to her brother, Harry Stoeckle. She also sold the Grand Union Hotel, which was renamed, the Hotel Stoeckle.